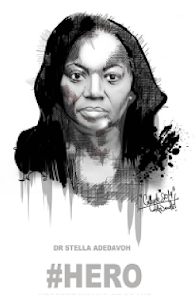 EVENTS!… We've all attended them…organised them… and occasionally suffered because of them. From Children’s parties to Weddings to Corporate Conferences and Seminars, Events have become a ubiquitous part of our lives. 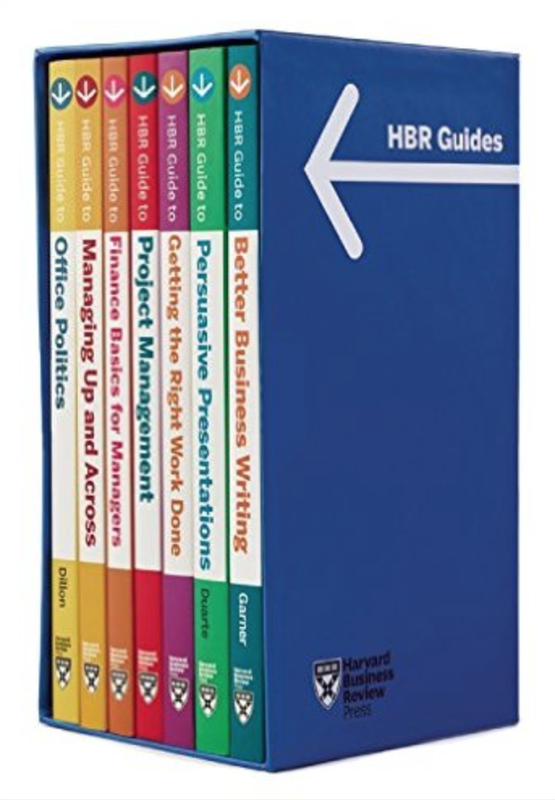 Events are now recognized as a critical means for businesses and brands to communicate with their various audiences. They are used to launch new products and services, drive social campaigns, sell political candidates, network with decision makers, create brand awareness, manage brand perceptions and ultimately generate return on investments - in short; Events are the definitive live marketing experience. This realisation has informed an increasing demand for the services of the Event Planner or Event Manager and a massive influx of players into the Events Services Industry. We have more event companies in Nigeria today than ever before. Sadly, however too many clients still find themselves having to do the very job they paid an Event Planner to handle! The Solution?… Get your Event Planner to enrol for the Event Engineering Workshop. The Event Engineering Workshop is a training initiative created to provide a platform for the transfer of knowledge and ideas from some of the keenest minds in the industry. The workshop holds from the 21st to the 22nd of October 2015 at the Balmoral Event Centre in Oregon. 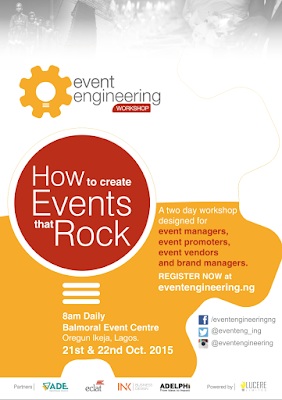 With the theme - “ How To Create Events That Rock”; Yemi Amusan, Funmi Victor-Okigbo, Edi Lawani, Femi Odewunmi, Naomi Lucas and Ese Oraka will facilitate an intriguing bouquet of sessions specially designed for Event Promoters, Event Managers, Event Vendors and Brand Managers. 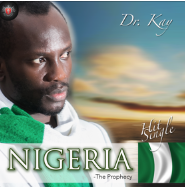 The program also features a special interactive session with Chocolate City Group founder Audu Maikori. This is one event no planner can afford to miss! 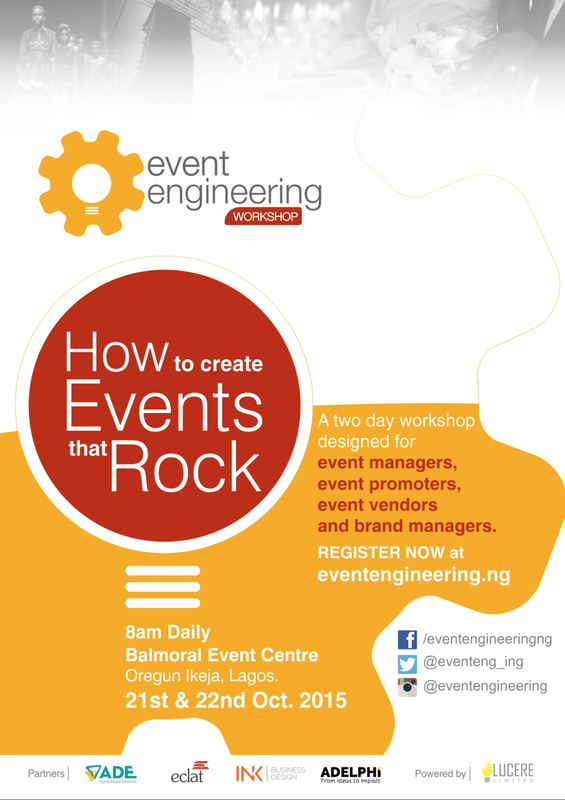 Check out www.eventengineering.ng and Register Now…spaces are limited!